Tributes have been pouring in following the death of the last surviving Dambusters pilot, Les Munro, who has died at the age of 96. Squadron Leader Munro died in his native New Zealand on Monday, August 3 after suffering from heart problems. Munro was a member of the RAF’s famous 617 Squadron which was formed at RAF Scampton in 1943 and used “bouncing bombs” to attack German dams during the Second World War. The Dambusters flew from Scampton on the night of May 16, 1943, with the first of the bombers heading to the Möhne and Eder Dams in the Ruhr valley. 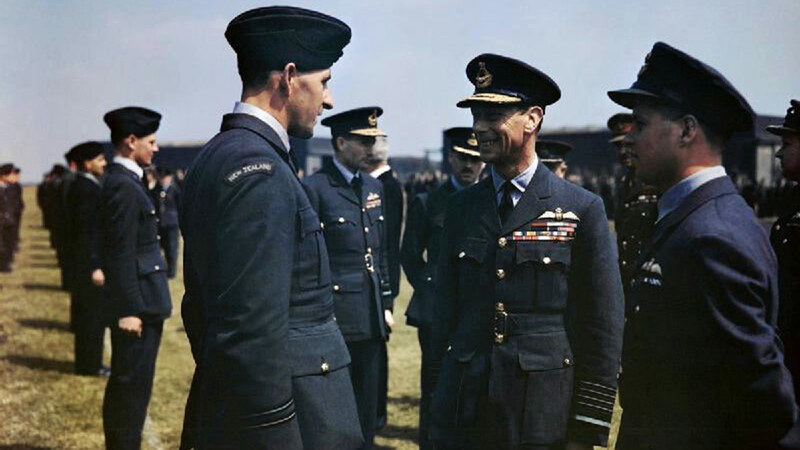 The visit of HM King George VI to No 617 Squadron (The Dambusters), Royal Air Force, Scampton, Lincolnshire, May 27, 1943 – The King has a word with Flight Lieutenant Les Munro from New Zealand. Wing Commander Guy Gibson is on the right and Air Vice Marshal Ralph Cochrane, Commander of No 5 Group is behind Flight Lieutenant Munro and to the right. Both of these dams were breached, causing significant flooding, and two hydroelectric power stations were destroyed. Factories were also damaged and an estimated 1,600 German civilians drowned from the attacks. Of the crew of 133 that set off from Scampton, Squadron Leader Munro was one of only 77 who returned. He was among those who were awarded the Distinguished Service Order for his part in the attack. Earlier this year, Munro sold his medals for £75,000 to British peer Lord Ashcroft, to pay for the upkeep of the Bomber Command Memorial in London. Many more from Lincolnshire and across the world have taken to social media to leave their tributes to Munro. Just two of the Dambusters’ crew members now remain – British former bomb aimer George Johnson and Canadian former front gunner Fred Sutherland.